Origin and historical notes: The dazzling whiteness of granite shaped into an impressive bestiary of megalithic proportions by the North wind, verdant imposing blood-red cork-oaks, transparent abysses of the purity of crystal It is the Land of Gallura, a name which echoes the term “Gallo” (Rooster) of the Pisan coat of arms of the Visconti family, first lords of the Giudicato. 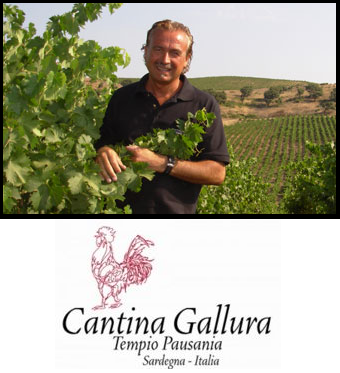 Since 1956 the term “Gallo” embodies the esteemed wines of the Gallura wine producing coopera tives. At the foothills of Mount Limbara grapes of exclusive “Gallurese” origin are gathered to produce a wide range of DOC wines that find in vermentino, recently awarded the DOCG (Denomination of controlled and guaranteed denomination of origin) trademark,the highest expression of quality. Although there is no absolute certainty, everything points to on the origin of the vine being the Iberian Peninsula, specifically Spain (Puliat 1888). The vine at first arrived on Corsica around 1300, courtesy of the intense commercial exchanges (between Spain and the islands of the western Mediterranean, under the Aragonese reign). The vine was later brought to Liguria (sometime between the fourteenth and the eighteenth century, during Genoa’s long dominance of that region of Italy). According to the connoisseur Levadoux, this hypothesis which explains why the vine, which is called “Vermentino” in Liguria, also took root in Corsica under the name of “Malvasia.” The same vine established itself on the island of Sardinia around 1400, when it was brought either from Corsica or Liguria.